Don't you just love Wednesdays? They just mean that the weekend is that much closer. Of course the DH is always working on weekends. Doncha just love retail work ? Everything is going much better on that front. In fact, Monday he had his second visit with the counselor and that evening he pops up with the fact that they were discussing me and it brought home to him how much he appreciates me and that he doesn't let me know that enough. That was very nice to hear. I also found out that my husband of eight years really does know how to give a massage. How did I not know that for eight years? Either I didn't ask correctly before or he has been picking up tips from our massage therapist. Well now I know and I won't be forgetting. 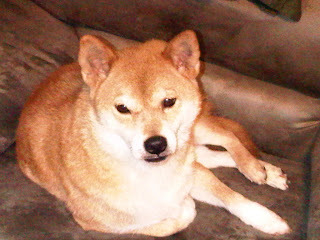 Oh I got some nice pics of our Shiba Inu, Kitsune which I will be sharing. I love my new BB. I have found that I am good at pics. Or at least animal pics. Well they are all sitting before my chair asking to be let out. What a great picture of your dog? Is he a mellow fellow or gal because the picture sure suggests laidbackness! Oh he is just a lump. Kit's favorite pastime is laying on my porch watching the neighborhood. If only I could understand exactly what he is saying as I am sure that he is quite the gossip.